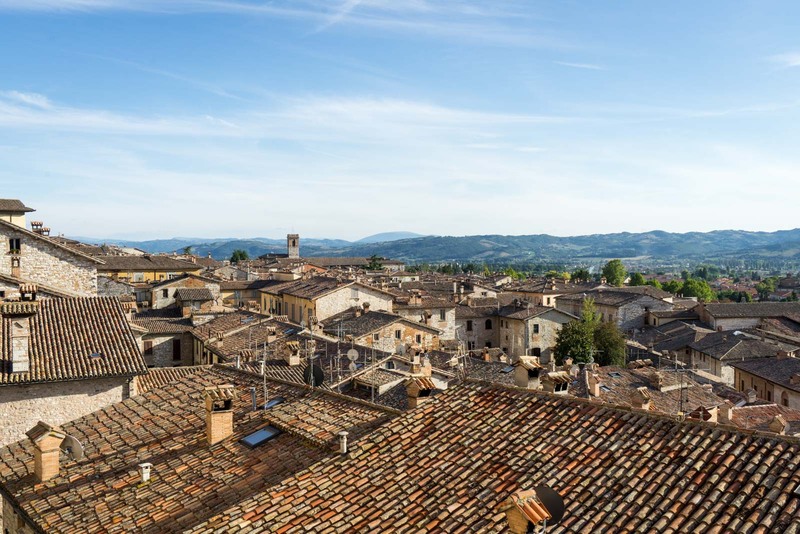 Travelling through central Italy, you get used to the crowds of tourists in the centres of the historic cities. 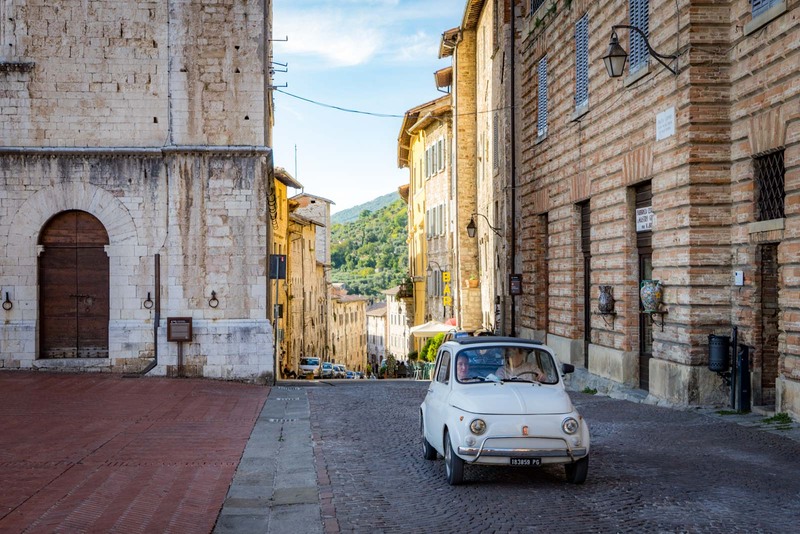 Go to Florence, Pisa, Siena, Bologna or Assisi and you’ll see wonderful sights… as you get slightly jostled or wait in lines. This is the price you pay to experience millennia of history in locations that have been marketed well to hordes of international visitors. And then sometimes you find a place that is just as good… but seems almost empty in comparison. Your heart leaps a little, as if you’ve discovered something that nobody else knows about. There’s an elation in this feeling and you carry it with you as you explore. For me this time, this place is Gubbio. 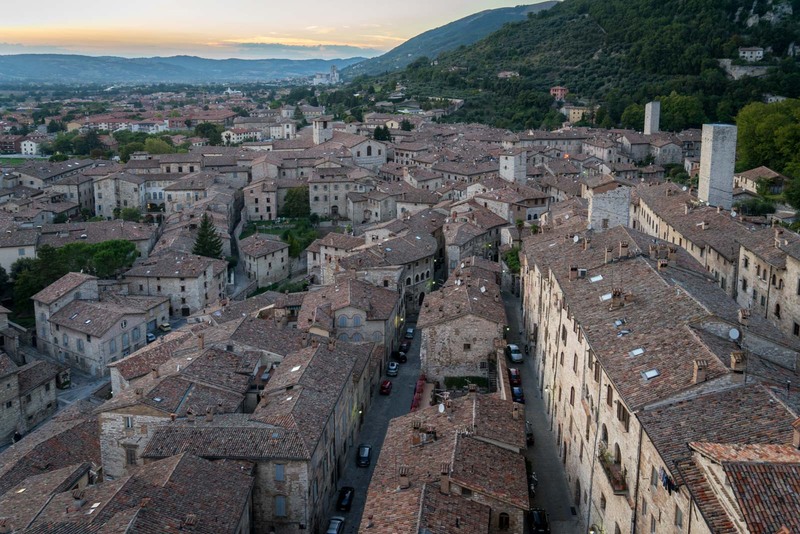 Gubbio is in the region of Umbria and is only about 50 kilometres away from the capital, Perugia. 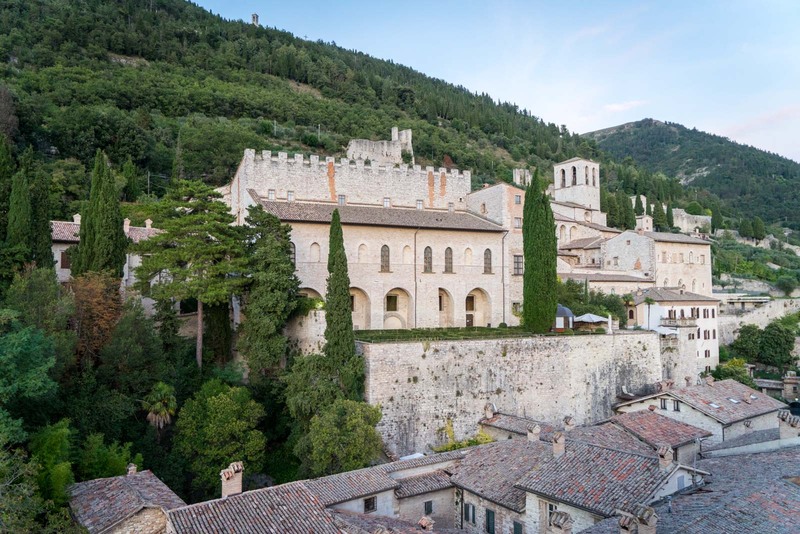 It’s also only about 50 kilometres from the region’s most popular destination, Assisi. 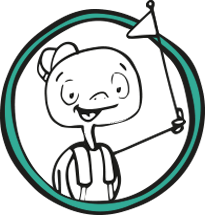 For some reason, though, the tourist trail seems to deviate around it… to the loss of those who race by on nearby highways and train lines, without realising what is so near. Even as I approach Gubbio, I can tell this place is going to be something special. Amongst green fields it rises up on a hillside, layers of terraces upon each other, each filled with defendable grey buildings. The hillside above it is a dense forest. Once in the city, the terraces seem to merge slightly, with inclined streets taking me gradually between them, past houses and official buildings. A system of free public elevators are available for those who don’t want to tackle the slopes. I am drawn upwards straight away and arrive in the main square in front of the Palazzo dei Consoli. The palace was built in the 1300s and is now the home to the excellent Civic Museum, telling the history of the region. 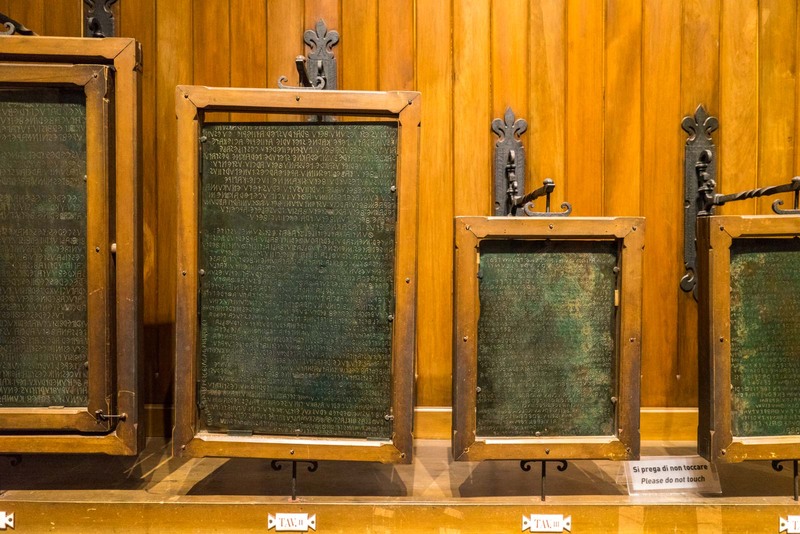 The highlight is the Iguvine Tablets, seven bronze tablets from the 3rd century BC with writing in an ancient (and now lost) Umbrian language. Heading down one of the streets, I hear a mother call out to her children who are playing on the footpath. Further along, an old man rides past on his bicycle. I spot a young couple drinking aperitifs under a cafe’s umbrella. They’re all locals and, as is explained to me, probably live right here in the centre. 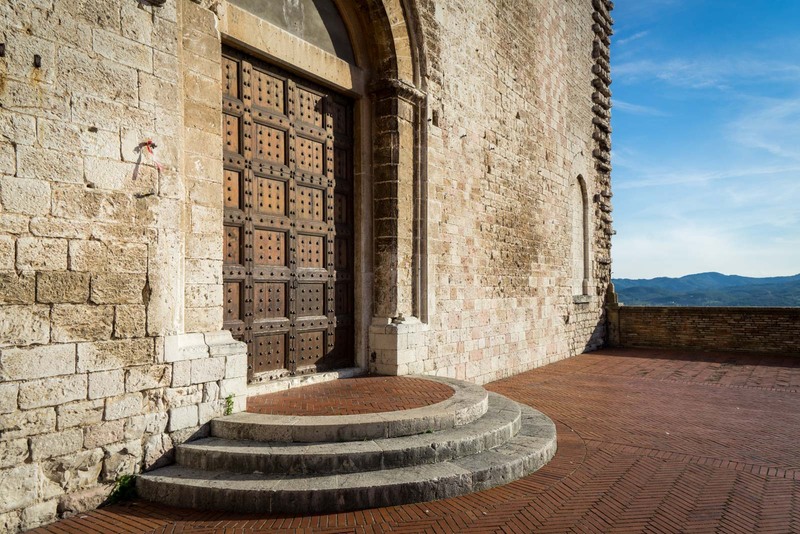 Unlike cities like Assisi, where residents have moved further out to make room for tourism-based businesses in the historic areas, these medieval buildings are still the heart of Gubbio’s community. 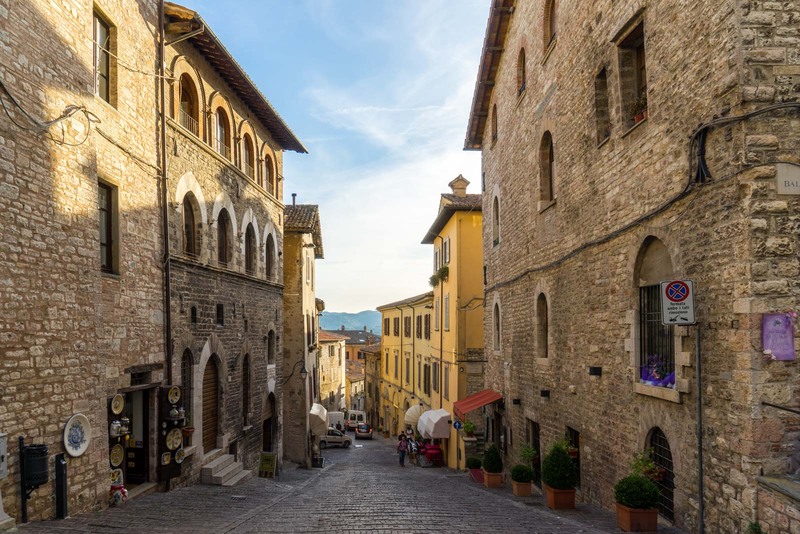 The authenticity of this city is part of its charm – there’s a consistent medieval feel to the streets which comes mainly from the rapid development in the 14th and 15th centuries when there was a lot of wealth and power in Gubbio. 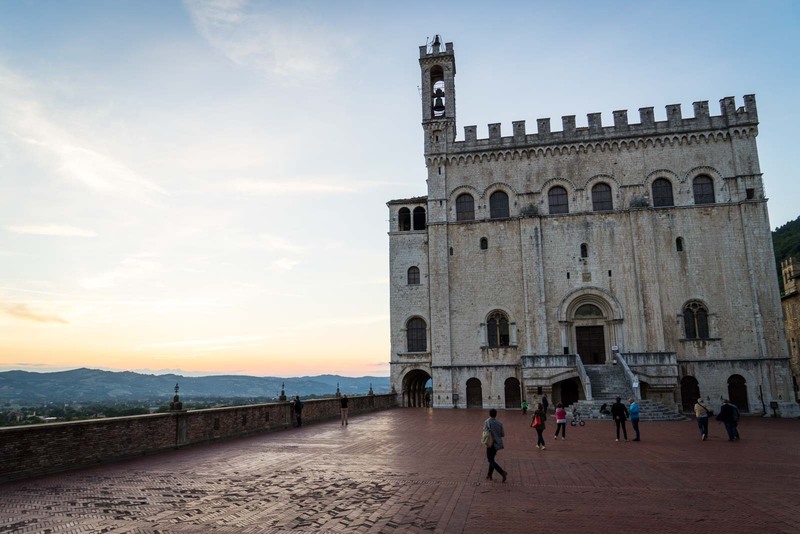 There are also a fair few specific sights to see – Gubbio’s cathedral is impressive, for example, as is the Basilica of St Ubaldo. I’m led into a small church on Largo Piero Luigi Menichetti. You would hardly know it’s there if you weren’t looking for it. With a simple wooden door with a small balcony above it, it actually seems like just one of the houses in this old part of the city. But this is the Church of St Francis of the Peace – not one of the large grand sites but a fascinating one and critical to the reason I’m here. 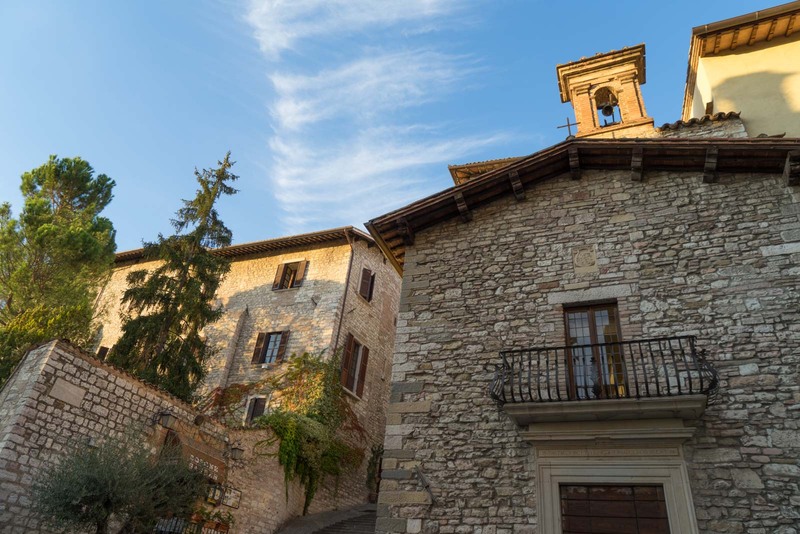 My stop in Gubbio is actually part of a trip I’m doing to experience some of the Way of St Francis, a pilgrimage walk from La Verna to Rome, through Assisi. 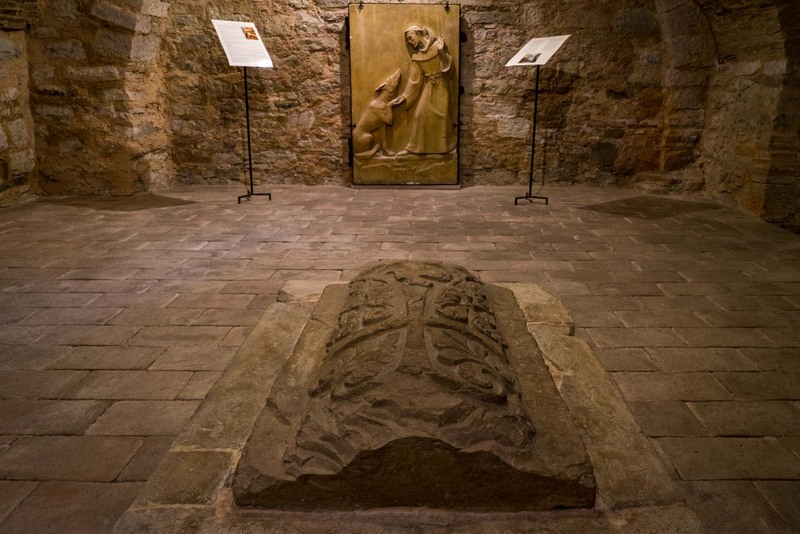 It takes walkers through some of the most important sites related to the story of St Francis and this is one of them. This small church was built on the site where the Wolf of Gubbio was buried. The legend is that there was a fierce wolf that was terrorising the residents of Gubbio in about 1220, attacking and eating them. They were so scared to leave their protective walls that the city was effectively under siege. Until St Francis came along. He dared to go out through the city gate and meet the wolf. It came charging towards him, fangs bared, ready to kill and eat him. But when St Francis made the sign of the cross and told the wolf to stop the attacks, it lay down calmly at his feet. The wolf then came back peacefully into the city with St Francis and the population could see that it had been tamed. The tale fits with the legend of St Francis who supposedly had a deep connection with nature. But many scholars will tell you that the story of the wolf is more likely representative of St Francis converting a particular person – maybe a rebel or criminal – to Christianity. Either way, it created a bond between the city and the region’s most important religious figure. And that has continued for 800 years. As I make my way up to my accommodation in the evening – the incredible Hotel Relais Ducale, set in an old palace – I think about this story of conversion. 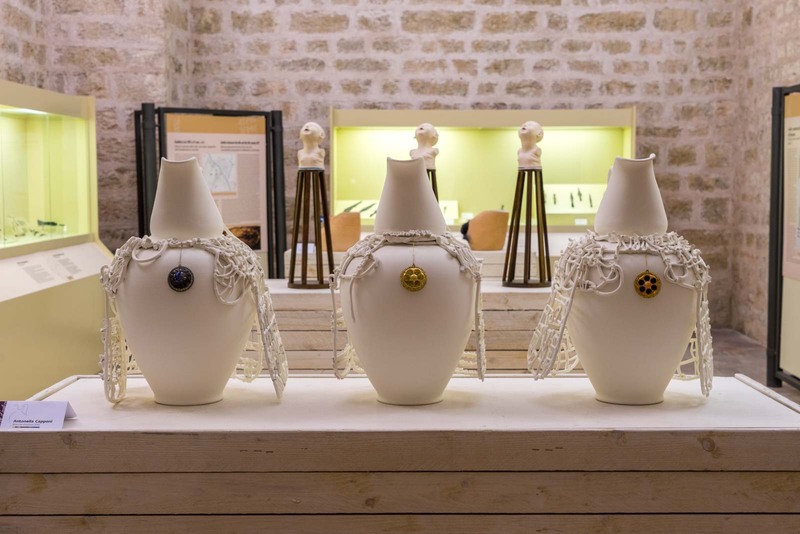 Perhaps there’s something about Gubbio that does this to more than just wolves or rebels. 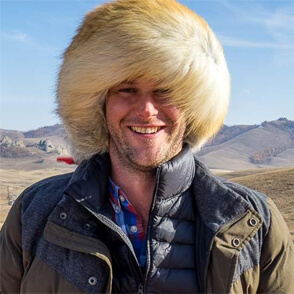 I feel a bit converted myself. Not to the story of St Francis (although I’ll write more soon about my thoughts on that) but to what is represented here by the history of the city. It’s preserved its legends and traditions without sacrificing any legitimacy for the sake of tourism. Don’t get me wrong – tourists do come here so don’t be shocked when you see them. There are also great hotels and restaurants to serve those who visit and stay. But you may be surprised when you realise how thin the crowds are compared to where you were the day before. And perhaps that will be enough to convert you too.